I have just returned from a week’s holiday in Majorca. I must say it was one of the best holidays I’ve had in ages! 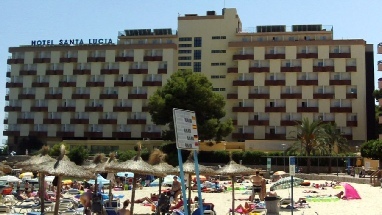 I travelled from Bristol Airport (staying the night before at the Winford Manor hotel, but more of that later), flying to Palma and then heading to my hotel for the week the Santa Lucia in Palma Nova. So for those of you who have never read one of my reviews before, I should warn you they are what can be best described as … comprehensive . Still, I hope if you decide to read this, that you’ll enjoy it. The trip started with an uneventful journey from Merthyr Tydfil, where I live, to just the far side of the second Severn Crossing. It was at this point that my SatNav went into melt down and, before I realised, directed me straight back onto the M4 heading for Wales, costing me £5.50 to visit my home country briefly once more, and in doing so, requiring an immediate about turn back over the bridge. This really was an omen as to how the rest of the journey would be. I travel along for a while with my co-pilot (SatNav) piping up with periodic instructions till I slow down for traffic and see a “Road ahead closed” sign at which point perfectly on queue the voice says continue straight for 4 miles … Oh Cr*p! … Still helpful signs say “Follow Diversion ahead” so I head up the hill, to almost immediately be greeted with 3 yellow diversion signs one with Black “A” another with a black “C” and third a black “Diamond”…(sorry couldn’t find the symbol for diamond on this keyboard) . Oh and no explanation of which route takes you where! So what follows can only be described as an hour and a half of hell! Eventually resulting in me ringing the local police station to be informed “we don’t know where the diversions go as the Council put them up!” Great, but in fairness they had a confab and came back with directions which, although they meant driving through the centre of Bristol, eventually got me to my destination, the Winford Manor Hotel. 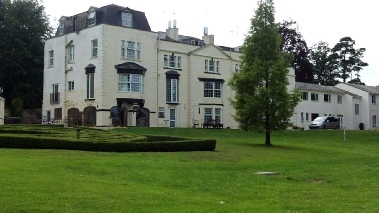 The Winford Manor Hotel is great. It’s an imposing looking building, looks a bit like an old Manor House with an extension added on. Inside the rooms are modern, en-suite, with flat screen TV’s, functional with all “mod-cons” including free Wi-Fi. The room cost me £90 single occupancy, for one night including 8 days parking and transfers to and from the airport. This even though my outgoing flight resulted in me being up before sparrow flatulence! So a rested night and I’m delivered to Bristol International Airport. Where I am able to check in immediately and head for the departure lounge. Flight is called we board, me using “Speedy Boarding” the service offered (at an additional fee of course) by EasyJet my chosen courier for the trip. Speedy Boarding means (at Bristol) we boarded first, even before families with Children. Resulting in me being able to grab one of the entrance row seats, and therefore not resulting in me having to attempt to fold myself like do-it-yourself origami into the space that modern airlines give you in “standard class” these days. I would definitely use speedy boarding again, with one proviso, if the airport you’re flying from buses you from departure gate to plane, and you usually can’t tell this before you book this service, then you’re on your own to try and get to your seats first, as I have heard it becomes a free-for-all. But in my case it was definitely worth the extra (I think) £15.00. Can’t find the exact cost on my bill I’m afraid. 2- may take me almost as long as the bus. So I paid for a private transfer, with HolidayTaxis.com who I found through the EasyJet website. I used this courier as it was one of the cheapest despite being linked to the airline, and had drivers checking the times of the flights, as a result being there when you actually arrive not when you should have arrived! My driver was very courteous and friendly and dropped me right outside the hotel within 25 minutes of exiting the airport. Oh and in a black Merc!! Did my cred no end of good that one ;o). The cost £70.60 return. 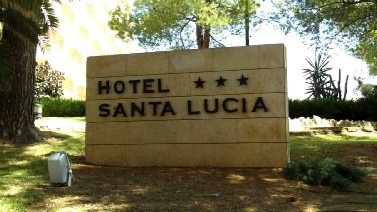 The Hotel Santa Lucia – Now must admit became a little OCD with this trip and was checking the TripAdvisor website everyday for the reviews of this hotel. So I’m not going to recount those here I am just going to tell you what happened to me. I arrived late but early, 30 minutes after we should have touched down but still 10:30a.m ish at the hotel lobby. Despite which I was greeted at Reception with confirmation of my booking, a welcome pack, my key and advice that my room was on the 4th floor and was ready! Can’t complain there then, as check-in was stated as after 2:00p.m. When I got to my room the cleaner in there was a little surprised to see me, but was able to just show me where you had to stick the door key-card to switch on the power in the room and wish me a nice stay. The room was spotlessly clean, had a TV with Sky News, BBC1 and one other English channel (not sure which one), as well as some Spanish and (I think) a German ones. There is a fridge and safety deposit box, these are charged for, €52 for both for the week, which includes a €10 refundable deposit, upon safe return of the key for the safe, pun intended . There was a large double wardrobe behind full length glass doors, and the room (As apparently all do) had a balcony with a table and two chairs, with a great view (from room 416) of the swimming pool and beach, together with the other hotels around the bay. In the week I was there I found the staff to be friendly, helpful and extremely efficient. I ate at the restaurant each day and found the food tasty, hot and plentiful. I was half board, so had “Full English” breakfasts (eggs (2 types), sausage, fried bread and beans) with Orange Juice, each day that I made it to breakfast. Well come on It was a holiday and I had some (read almost all) late nights. Now, if you’ve read the other reviews of this hotel, we come to the main two things people mention. I will start by saying I can’t confirm that people queue from 6:30 or 7:00am for sun beds (as I had no intention of getting up that early to verify this) but I can confirm whenever I looked out of my window they always had towels on them. However the beach is literally 20 seconds from the entrance of the hotel and I never failed to get a spot on that! You can hire sun beds on the beach, but the shop in the hotel sold (pre-inflated) li-lo’s (plastic inflatable “beds”) for €3.50. So that’s what I (and anecdotally, it appeared) 80% of the other guests did. Second “usual” complaint “full of OAP’s” now I am not saying that there weren’t any there but they definitely did not greatly outweigh other age groups when I was there. In fact I would say families with children (of all ages) were the single biggest demographic. To sum up the only criticisms I have of this hotel is the non-labelling of the food in the restaurant and the thinness of the walls, in the rooms. The latter not being a problem until the morning & night of my last day. When I was first awoken, by the non-too edifying sound of someone greeting the new day “praying at the porcelain alter” as we call it locally, also known as having a Technicolor yawn … you get the picture! … Hopefully not too clearly, and went to sleep listening to the same person having a discussion I could have joined in with should I have wanted to. One thing I will say in its defence, this room did have an inter-connecting door, albeit apparently disabled, to the room next door, and this could have been part of the problem. The Holiday itself was brilliant, I went alone, long story, but work commitments resulted in an enforced change of dates. However, I don’t think in the real world telling a Bride and Groom I didn’t turn up at their Wedding as I fancied in break in Palma Nova would have done my business, let alone my conscience any good… Oh and the money I would have lost was what paid for the holiday anyway! The week followed a similar sort of pattern, get up, have breakfast, go to the beach or sightseeing, have an evening meal, watch a movie then go out for the evening. So rather than bore you with a day by day breakdown, I’ll give you edited highlights. 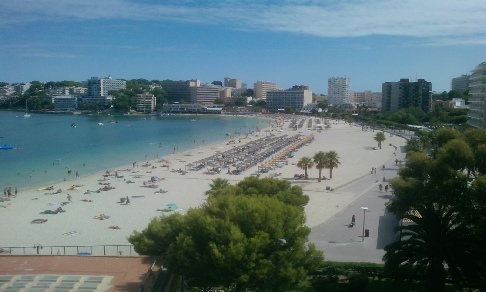 The Beach in Palma Nova is great, well they all appeared to be. The one I went on was between Palma Nova and Magaluf. It was here I spent almost every day, for varying amounts of time, quietly toasting myself! 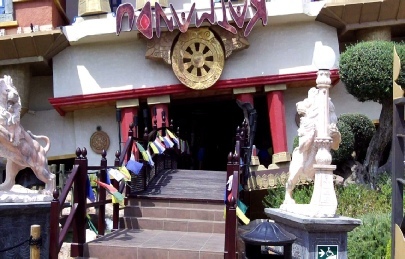 One day I went to the “House of Katmandu”- a tourist attraction in Magalluf. 2 – If people behind you aren’t too close you can lift your hands just out of the water and look like they’re still submerged in it. In so doing looking a damned side more macho than you would if like me you pull your hands out after about … 45 … okay … 35 … okay … 15 seconds! ;o). There’s an interior bridge that can make you feel like you’re in the title sequence of Doctor Who, a piano with no keys! But jets of water that when interrupted make the sounds, add to this Sharks Teeth, transformation booths, animatronic figures and some landscapes / landmarks made from matchsticks including a massive Hogwarts School that can take your breath away. When you exit the house you have a 4D cinema experience which is basically a 3D film while you’re strapped into moving seats. Great fun, although personally I thought, a little on the short side for the cost involved. All in all I would say good value to see once. I paid €21 for the House, 4D Cinema (1 film) & access to a nearby “Crazy Golf” course, which I didn’t go to. It also included a “10% off one drink” ticket for their bar. 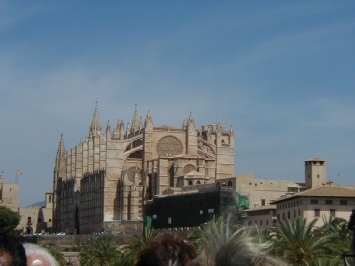 The City of Palma – On the Thursday I decided to travel into Palma city to take the Open-top bus tour. This involved a “service” bus from Palma Nova, they run every 20 mins or so and cost under €5 one way, taking about 35-45 minutes. The numbers of the busses are: 106, 107 & 111. You can catch them from outside the Tourist information Office in Palma Nova. 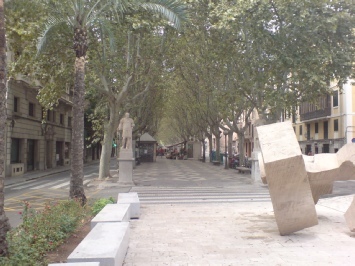 Now I’ve visited Palma a number of times, as the twice I stayed in Majorca previously I stayed on the outskirts, and used to walk in and around the city almost daily. 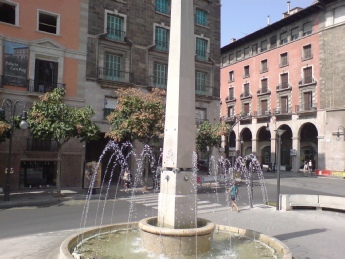 The Sight-Seeing bus is a great way to see and learn about the city, the tour costs €15 and for that you get a set of headphones that you can plug into the bus by your seat and listen to a recorded tour, available in English, Spanish, Catalan, French, German, Italian, Portuguese or Swedish. The tour takes about 80 minutes and you can hop-off and on as many times as you like within a 24 hour period. I arranged to meet up with two groups of people whilst I was there, one didn’t come off due to unforeseen circumstances, the other did, partially, and this was where I met the great Moocher! 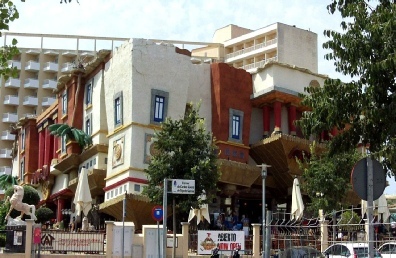 Moocher is a resort expert on the forums of TripAdvisor.com for Palma Nova, actually living there most of the year. He also co-runs with the elusive Daryn (maybe we’ll bump into each other next year) the MajorcaForum.com. Without doubt the most useful resource I have found for information on Majorca. It has a forum (as one would imagine) where you can post (in my case inane) questions and people who have visited the area a lot more than you can answer them for you. Also the “main page” contains advice on bars, accommodation, places to visit, entertainment, everything you could need really, and a friendlier bunch of people I have never met in all my years on t’internet! 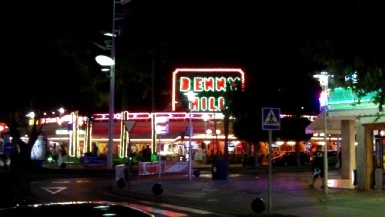 We originally arranged to meet at Benny Hills Bar in Magaluf on the Thursday night, but circumstances conspired and it didn’t work out. 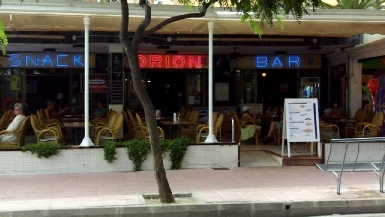 However the next day Moocher happened to be in Palma Nova and we met for a drink at the Orion Bar literally outside my hotel. We chatted for nearly an hour and he was easily as helpful and friendly as his cyber alter-ego. Hopefully I can meet up again with a few of the others, when I definitely return to Palma Nova. I popped into was offering tickets for the same price as the official website (www.comeflywithme.com) and this included transport both ways (more of that later). So, as it only runs Thursdays and Saturdays I booked for Saturday night. Slight confusion here, just checked the website and it says 9:30pm start, now I only went last weekend and I could have sworn it was 10:15pm start, so “check local listings for details” is my tip. The bus collected me from the next hotel down the street from where I was staying and after 2 stops, both of which were extended. Due, at the first, to the people who had booked not showing, and at the second, as we were late, the people having left. Resulting in the guide running off down one street, and the bus squeezing down another, that I personally wouldn’t have wanted to take a moped down, to find them. We were assured after this, as the short journey resumed, that the show doesn’t start until all the busses have got there, not sure if this is the case but it was what happened on the night I was there. One thing I was not told about before or when I booked, was if you’re going and you fancy a flutter after the show, TAKE YOUR PASSPORT, something that wasn’t mentioned to me, and as the bus waits 30 minutes after show time for people to visit the casino it’s handy to know. Now to the show itself … SPECTACULAR! … That about sums it up. I will say I’m not the greatest Frank Sinatra fan, and have never been to the “Cirque” type acrobatic shows, despite having had many chances, whilst visiting Las Vegas, New York and London, when they were on there in several of their incarnations. 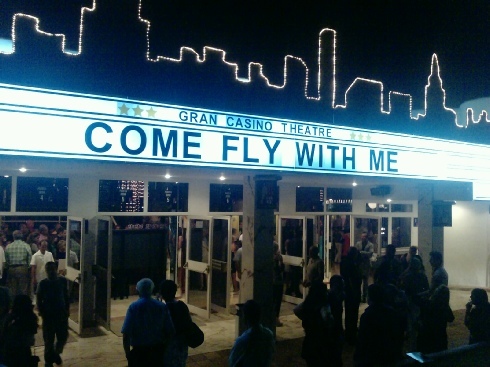 But in this case the combination of the brilliant singing of Chris Mann, the gorgeous dancers, not one lady amongst them, that I wouldn’t wish to fly me to the moon. Together with the acrobatics and epic scale of the production made for a wonderful evening’s entertainment. Stand out numbers for me “A very good year”, “Mr. BoJangles”, “That’s Life”, “New York, New York” and of course “My Way”. I won’t spoil the surprises by explaining individual numbers, but take my word for it… GO SEE THIS SHOW! Oh and for anyone who was a little “underwhelmed” by the raucous nature of the Pirates show in Magaluf, this is the show I would see, same spectacular acrobatics less of the “humour”, which incidentally I loved, when I saw Pirates. 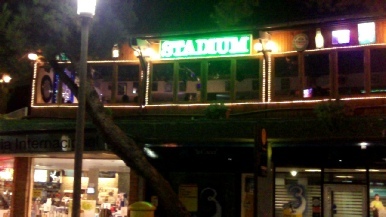 Palma Nova / Magalluf have some great bars – The Stadium Showbar (Palma Nova) being one of my favourites, the “entertainment” starts about 11:30pm when the act (Tribute acts, such as Queen, Blues Brothers, Drifters, Elvis or Rod Stewart) is on, but prior to that you have a good family atmosphere, karaoke, and reasonably priced (for the area) drinks, oh and before you ask no I didn’t sing… put it this way my voice is so bad I MIME when I’m alone in the shower! Mambo’s (I think it was called something like that) in Magaluf with its outdoor bars, Mechanical Bull and great atmosphere was another must for me. 2 – They play “Mr Lonely by Akon / Bobby Vinton” not a reason in itself to leave an area, but whenever that song is played it means that they have spotted some poor soul standing on their own, and are using the cameras around the square to put them on the big screens all round the place. As someone who was travelling alone AND makes videos for a living I can say I’ve never been so paranoid ;o). But there are a number of bars around the square and the main club as well, oh and the bar staff at BAYWATCH Bar were stunning! So there you have it. Some people criticize others who go to resorts like this “Blackpool with Sun”, “English food, English telly”, “Why not stay at home” etc. However, to be honest in my opinion, you can go where you like, if you want to get some sun but still keep up with your soaps, why shouldn’t you. By the same token if your idea of a holiday is hiking up the Himalayas in khaki shorts wearing a sombrero fill your boots my son! It’s a free world and don’t criticize anyone for doing what they want to. I had a great holiday, different to what I’ve done in the past, but somewhere I would definitely like to visit again. Hopefully next year, as having been there I’m starting to know my way around, there is a heck of a lot more to see, the weather was great, and the travelling time reasonable.